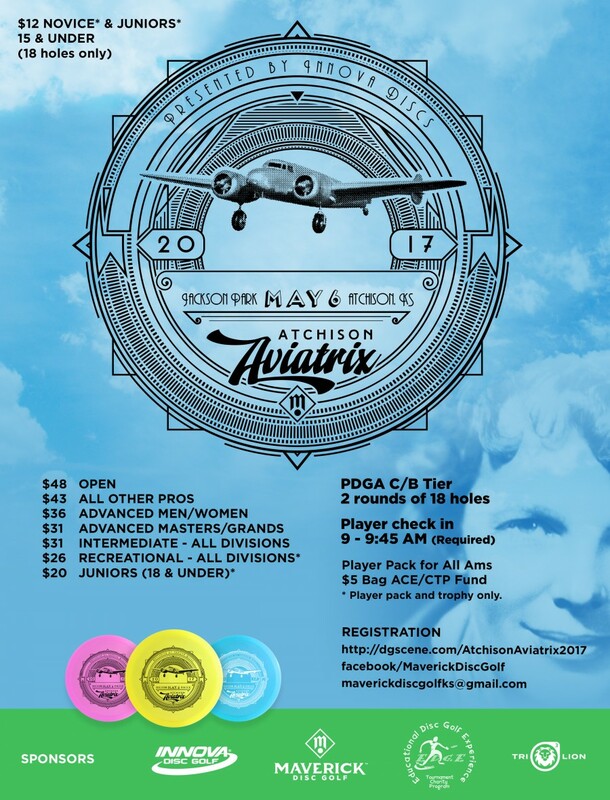 Besides the regular 2 rounds of 18 hole event for the Atchison Aviatrix, there will also be a Junior II (15 & Under), III, IV and V (8 & Under) side event where they will be playing 2 rounds of 9 holes (probably back to back). It is a PDGA B-Tier for Ams, so the juniors will get a rated round and points if that is something you are interested in. Regarding a player pack, the juniors at the side event will get a tournament stamped DX Leopard, DX Shark or Black DX Aviar. Additionally, the first 95 players for any division (Pro, Am, Junior big course or Junior small course) will also get an XT Atlas as part of Innova's sponsorship. Organized junior event, PDGA sanctioning, 1-2 discs, for $12. I'm actually losing money on this. To be aware, the junior 9 hole course is shorter than the normal course, but it is not 'easy'. There is still significant elevation, some holes actually have some distance (one is 420') and OB roads surround the park. There can also be wind depending on weather. However, compared to the Jackson Park 18-hole course it is easier. Think of Blue Valley in KCMO. The junior 9 is easier, but it's not easy. It too has significant elevation, OB sidewalks, one hole is 400', can also be very windy...pretty much like Jackson Park 9. Here is the dgscene page for the Jackson Park 9. Junior I (18 & Under) are invited to play in the longer 2 rounds of 18 main event. We have our first Junior player sign up for the side junior event. It would be great if we could get a few more kids from the KC area to join him. We had six juniors total played in this tournament, five of which played in the side event. Ages ranged from 7 to 13. I really appreciate the parents supporting the tournament that is trying to make something specific for the kids. At the $12 entry fee to get two discs, along with other expenses, hopefully it was apparent I was doing this to get kids to play and not make a profit.